Signed and dated l.c., "C L EASTLAKE...1824.". Signed l.l., "[C L E]ASTLAKE...". Horatio Walpole, circa 1824, Painted for Horatio Walpole, 3rd Earl of Orford (1783–1858). 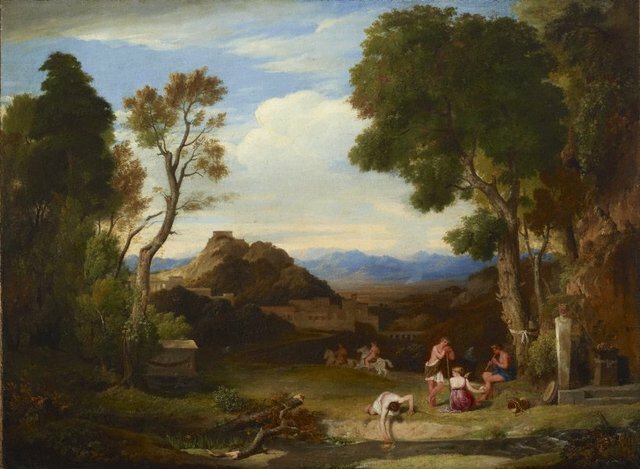 His (anon) sale, Christie's, London, 26–28 June 1856, 3rd day, no 250 ('A classical landscape, with Arcadian figures near a terminal statue; buildings, and mountainous distance. A beautiful composition, painted at Rome'). Pennell, 28 Jun 1856-pre 1881, London/England, Purchased at the previous sale, 170 gns. George Comer, pre 1881, By 1881. See exhibitions. Newman, post 04 Dec 1909, Purchased at the previous sale for 13 gns.